The presence of few leading players is what makes the Asia Pacific butene-1 market increasingly consolidated and fairly consolidated, notes Transparency Market Research (TMR). Several top players are bolstering their production capacities to meet the burgeoning demand for the compound the region. The competitive landscape features a low level of threat from the entry of new players. A growing number of key players are vying for joint ventures in the potentially lucrative markets of China and ASEAN to stay ahead of others. Prominent names include ONGC Petro additions Limited, PetroChina Company Limited, China National Petroleum Corporation, China Petrochemical Corporation, and Petrochemical Corporation of Singapore (Private) Limited. 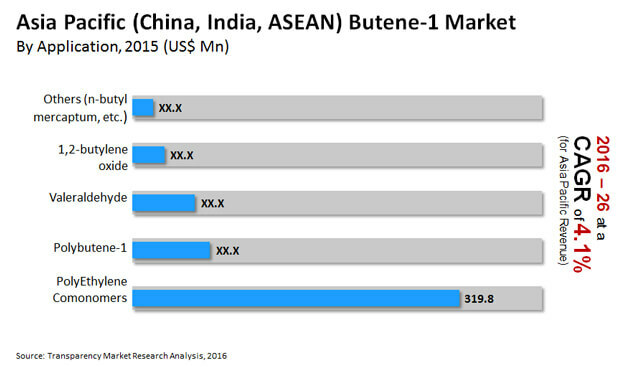 The Asia Pacific butene-1 market is projected to expand at a CAGR of during the forecast period of 2016–2026. The market stood at US$508.6 million in 2015 and the opportunities in the regional market is anticipated to reach a worth of US$787.8 million by 2026. The various applications of butene-1 are n-butyl mercaptan, polyethylene comonomer, polybutene-1, valeraldehyde, and 1, and 2-butylene oxide. Of these, the polyethylene comonomer segment accounted for the massive share of around 65% in 2015 in the Asia Pacific market for butene-1. This is attributed to the vast uptake of the compound in the production of high density polyethylene (HDPE) and linear low density polyethylene (LLDPE) products in the region. Geography-wise, China has emerged to the fore with its robust supplier base and it held the share of more than 65% in the regional market. Substantial production capabilities in the country will help it retain its dominance throughout the assessment period. The Asia Pacific butene-1 market has witnessed steady expansion over the past few years, riding on the back of the rising demand for plastic packaging materials. The extensive application of butene-1 in making polybutylene-1 and polyethylene is a notable factor boosting the market. The bold strides being made by the packaging industry in the region in the recent years has fueled the demand for butene-1. Polybutylene finds vast application in a variety of consumer goods and automotive interiors and exteriors. This is a notable factor accentuating the growth of the Asia Pacific butene-1 market. The regional market is accentuated by the rapid rising volumes of consumption of HDPE and LDPE products. The attractive application of the organic chemical compound in the industrial production of these products is accentuating the growth of the market. Manufacturers and producers are also witnessing lucrative prospects in India and China. In particular, there is oversupply of butene-1 in China. The substantial usage of polybutylene-1 in making a variety of plastic packaging materials is propelling the growth of the regional market. The Asia Pacific butene-1 market is witnessing few setbacks, most notably the easy availability of substitutes. The giant leaps that olefins have taken has led to the increased production of hexane-1 and octane-1 which are potential substitutes for butene-1. The wide application of butene-1 in making co-monomers in the synthesis of polyethylene is acting as bottlenecks to the growth of the regional market. Efforts to improve the performance properties of the substitute is hindering the uptake of butene-1. Furthermore, the rapid variation in the supply of raw materials, notably Crude C4, has crippled the expansion of the regional market. The problem of constrained supply of C4 is accentuated by emerging trends in shale gas production. Nevertheless, the attractively rising production of butene-1 in China and ASEAN will open lucrative prospects in the Asia Pacific butene-1 market. The study presented here is based on a report by Transparency Market Research (TMR) titled “Butene-1 Market (Application - Polyethylene Comonomer, Polybutene-1, n-Butyl Mercaptan, Valeraldehyde, and 1, 2-Butylene Oxide) - Asia Pacific Industry Analysis, Size, Share, Growth, Trends, and Forecast 2016–2026”.